I think each one of us know about this healthy foundation. 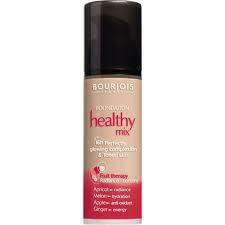 So Bourjois has come up with the foundation which is healthy.Why it is called so? Because they say it allows skin to breathe without being suffocated for some fresh air.It has extracts of apricot which enhances radiation, melon for its hydration properties,apple as its is rich in anti oxidants and ginger to energise the whole appearance.As claimed by company it stays on for 16 long hours. Product comes in the volume of 30ml and is readily available online as well in stores. I liked this foundation too. I am no 53 beige clair. Before going forward to buy the entire full pack I visited one of the store and asked them for some samples so that I should know if I am going to like it or not. I am using it daily as my foundation as he formulation is light weight, very blendable. Coverage is not as intense but as I said its light weight makes it a must buy. They have come up with good range of shades. I am loving it.